Jeopardy! is an American television game show created by Merv Griffin. The show first appeared on NBC, where it was hosted by Art Fleming from March 30, 1964 to January 3, 1975 and again from October 2, 1978 to March 2, 1979. Beginning on September 10, 1984 and continuing into the present, the show is in syndicated format and is hosted by Alex Trebek. Versions of the show have been made in many foreign countries throughout the world. Since the syndicated version premiered, the show has won the most Emmy Awards of any game show on daytime television. In 2001, TV Guide named it the second-best game show of all time. A "Griffin Award," a trophy given to the Grand Champion Jeopardy! 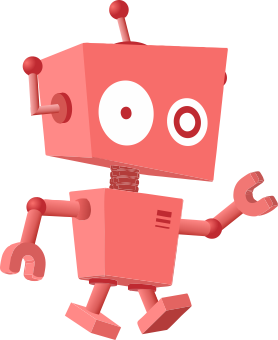 Unlike regular trivia games, the answers are given as clues, and players come up with questions as an answer. For example, a clue would be "one of our Founding Fathers, he was our first president", and the right answer would be "who is George Washington?". The game of Jeopardy! consists of three rounds: the Jeopardy! round, the Double Jeopardy! round, and the Final Jeopardy! round. In the Jeopardy! round, there are six categories with five clues in each, each worth between $200 to $1000. The Double Jeopardy! round is like the Jeopardy! round, but the clues are worth double the amount. The Final Jeopardy! round is made up of just one category and one clue. Only players with more than $0 after the Double Jeopardy! round may play the Final Jeopardy! round. During the commercial break, players write their wagers based on their knowledge of the given category. After the commercial break, the host reads the clue. The players have 30 seconds to write their answers, again in the form of a question. During this time the lights dim, and the "Think!" theme plays in the background. The player with the most money at the end of the game keeps his or her winnings and comes back to the next show. Second-place players get a $2000 cash prize, and third place players get a $1000 cash prize. "Jeopardy!" 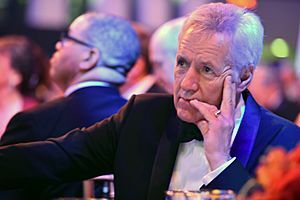 host Alex Trebek at the 2016 USO Gala, Washington, D.C. Since the show started in 1964, there were various songs and arrangements that were used as the show's main theme. Most of these were composed by Merv Griffin. The best known theme song is "Think!". It has served as the countdown music for the Final Jeopardy! round since 1964. Between 1964 and 1975, a jazz tune called "Take Ten", composed by Julian Griffin, served as the main theme. When the series was revived in 1978, "Frisco Disco" served as the main theme, and "January, February, March" served as the opening theme. They also were used in the first pilot of the Alex Trebek-hosted version. At the start of season 9 in 1992, the main theme was remixed to include a bongo track. At the start of Season 14 in the autumn of 1997, a new version of both the main theme and "Think! ", composed by Steve Kaplan, was introduced. The main theme involved a more piano-driven, orchestral, jazzy sound. When the show aired episodes in Las Vegas, Nevada in February 2001, an updated, sped-up version of the 1997 was rolled out. It was then put permanently into use from the April 23, 2001 episode onward. An all-new arrangement of both the main theme and "Think!" was introduced at the beginning of the show's 25th season, arranged by Chris Bell Music, Inc.
Like the theme music, the Jeopardy! set changed over the years. The original gameboard was exposed behind a curtain. The clues were printed on clue cards, which were shown as a player asked for a certain clue and its value. In 1978, the cards were dropped in favor of flipping panels which had the dollar value on one side and the clue on the other. Also, the curtain was changed to double-slide panels. When the show came back in 1984, the gameboard was changed again. This time it was made up of 30 television screens for each clue in the categories. In 1991, the original screens were changed to larger screens. In 2006, the screens were changed to a projection video wall. Then in 2009, the video wall was changed to 36 HD flat-panel screens. Other changes to the set have been made since the start of the syndicated version. 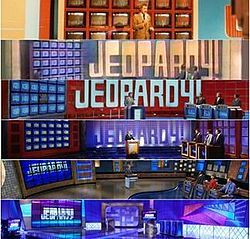 Starting in 1985 and continuing until 1997, the sets were designed to have a blue background for the Jeopardy! round and a red background for the Double Jeopardy! and Final Jeopardy! rounds; however, starting in 2005 and continuing into the present, the background color changes to red when the lights dim during Final Jeopardy! In November 1996, two months after the start of Season 13, a new set made by Naomi Slodki was brought in. In November 2002, another new set made by Slodki was brought in. This set was slightly changed in 2006 when Jeopardy! started airing in high-definition. A new set came out with the Tournament of Champions and Celebrity Jeopardy! taped in 2009 at the Consumer Electronics Show in Las Vegas, Nevada. It became the main set at the start of Season 26 in 2009. It was replaced with another new set at the start of Season 30 in 2013. Jeopardy! Facts for Kids. Kiddle Encyclopedia.